Slingin' Sammy Baugh has finally gone to meet his maker. At the age of 94, Baugh passed away at a hospital in Rotan, Texas, on Wednesday night. Baugh was a Texas legend and an NFL legend, a quarterback who was way ahead of his time playing for the Washington Redskins from 1937 to 1952. That followed a stellar collegiate career at Texas Christian. While he was noted for his passing, Baugh was one of the best all-around players of his day. One season he led the league in passing, defensive interceptions and punting. In one game, he threw four touchdown passes and intercepted four passes. He threw six touchdowns in a game — twice — and kicked an 85-yard punt. But this is a golf blog. Why am I writing about a football player? Well, did you know that there's a golf course in Texas named after Baugh? Sammy Baugh Golf Course is in Snyder, in West Texas. 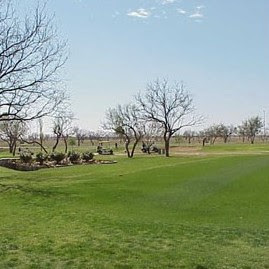 It's a 9-holer on the campus of Western Texas College that is maintained by instructors and students in the Golf Landscape Technology Program, a vocational program offered by the college. Baugh, right up until his last years, was known for showing up to play the course named after him. It's the kind of golf course that so many small-town Texans grow up playing: Hard, fast, wide open and windswept. The kind of places that led Ben Hogan to coin the term "Texas wedge," and the kind of place that caused Chi Chi Rodriguez to once advise any golfers who want to learn how to play in the wind to move to Texas.